February 2010 – New York, NY – Pack your bags and batter up! If you love the game of baseball and feel the same way about Israel, then read on! Join Jewish National Fund’s (JNF) first-ever baseball mission to Israel May 8-15, 2010 and bring your cleats because you’re going to be playing your way across the country. Yes, this week-long trip includes daily games and clinics with the Israel Association of Baseball, coupled with touring the land. With over 100 years of experience as caretaker of the land of Israel, no one knows Israel better than JNF. JNF missions, arranged through JNF’s Travel & Tours Department, allow you to see a side of Israel that other trips don’t, going above and beyond the classic tourist experience. The Baseball Mission to Israel looks to do one better than that. JNF’s Project: Baseball is a far-reaching plan to foster the growth of baseball in Israel, where the number of fans and players is on the rise but adequate baseball fields are scarce. The campaign involves building state-of-the-art baseball, softball, and professional-caliber fields throughout the country to provide recreational outlets and entertainment opportunities for Israelis of all ages. The first real baseball field in Israel was built in 1979. Today, there are scores of leagues throughout Israel, accommodating players of all ages, genders, and denominations; it is estimated that the number of regular baseball players exceeds 2,000. Israel’s baseball federations — the Israel Association of Baseball (IAB) and the Israel Softball Association (ISA) — compete against teams from Europe, Asia, North America, and the Middle East. 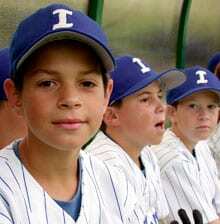 Since 2001, the IAB has held annual “peace clinics” in which children from Jewish and Arab schools meet on the baseball field to learn the sport and make new friends, giving them rare opportunity to interact and work together. The result of these clinics is Tel Aviv’s first Jewish-Arab baseball team in Jaffa. Growth of the sport has been stymied by a severe shortage of baseball fields. In Jerusalem, where hundreds of adults and children participate in league play, there is only one true baseball field, but instead of grass, it is covered with a dangerous combination of dust, rocks, and thorns. In Bet Shemesh, the only field is built on a slope, forcing children to run uphill to reach first base. Haifa, Be’er Sheva, and Tiberias have no baseball fields at all, so players must travel to other cities. As part of Project Baseball, JNF has upgraded and enhanced two baseball fields—Sportek, a much-needed facility outside of Tel Aviv that hosted the 2009 Maccabi Games and caters to local amateur players, and the field at the Yarkon Sports Complex in Petach Tikva, which is used by hundreds of people each day. Now JNF is committed to upgrading Israel’s first baseball field at Kibbutz Gezer. Located between Jerusalem and Tel Aviv, the community overlooks the historic route that Herzl took from Jaffa to Jerusalem at the end of the 19th century. The kibbutz’s baseball field is used by fans throughout the region, especially those from the popular baseball/softball enclaves of Bet Shemesh and Modi’in. It is also a favored site for games of the national softball league. Long-term plans call for creating an all-inclusive Sports Park at Kibbutz Gezer, which in addition to baseball fields will include basketball courts, soccer fields, a swimming pool, and a children’s playground. In addition to daily games, trip highlights include stops in the Old City of Jerusalem, Yad Vashem, Atlit Illegal Immigration Camp, lunch with soldiers at an IDF base, a day tour of the Negev, and an optional trip to Massada, just to name a few itinerary stops. Land Only: $2360 (based on double occupancy). Single supplement is $595. Includes six nights at a Tel Aviv hotel, seven days with a guide, entrance fees and all touring and transfers. For information, contact Hannah Schwartz at hschwartz@jnf.org or 212-879-9305 ext. 254. Jewish National Fund (JNF) began in 1901 collecting coins in blue boxes to purchase land and return the Jewish people to their homeland. In over 107 years, JNF has evolved into a global environmental leader and become the central address for partnering with the land and people of Israel. JNF has planted 240 million trees; built over 1,000 parks and recreational areas; constructed security roads; educated students around the world about Israel; created new communities so that Jews from around the world would have a place to call home; discovered new means of growing plants under arid conditions, bringing green to the desert; and built over 200 reservoirs and water recycling centers, increasing Israel’s water supply by 10%. Today, JNF is supporting Israel’s newest generation of pioneers by bringing life to the Negev Desert, Israel’s last frontier. A United Nations NGO, JNF sponsors international conferences on desertification, shares afforestation techniques, and funds research on arid land management. JNF is a registered 501(c)(3) organization and continuously earns top ratings from charity overseers. For more information on JNF, call 888-JNF-0099 or visit www.jnf.org. Ariel Vered is the Communications Manager for the Jewish National Fund, in New York. Mimouna is a traditional festival celebrated by Moroccan Jews the day after Passover, marking the return to eating chametz (leavened foods).